Ecuador’s higher education system has changed in recent years due to a new national constitution ratified in 2008, and a new organic law on higher education, which passed in 2010. These two documents overhauled university funding, administration, staffing, accreditation, professor qualifications, and made attending public universities free of charge for students. While the documents outlined an immediate shift in policy, in practice many changes were designed to be gradual in order to minimise disruption to school operations. But as time has passed, the effects of the overhaul are solidifying. Today ICEF Monitor looks at the rapidly evolving Ecuadorian education sector, its students, and the country’s ambitious plans for the future. Ecuadorian education begins with a pre-school period called educación inicial, which can start anywhere from age three to five. At five years old students enter educación general básica, which is mandatory and lasts until age fifteen. Afterward students can continue into educación bachillerato, an interdisciplinary approach divided into sciences/humanities or agriculture/business/industry/arts. English instruction is mandatory during educación bachillerato, but Ecuador currently ranks low in English proficiency. The government has made a change to address this problem, requiring public school teachers of English to take the TOEFL test as an evaluation measure. The goal is for them to reach a B2 level, better equipping them to instruct Ecuadorian students, in turn better preparing those students for university. In the past, all high school students were able to enter university regardless of academic performance, and gaining access to certain schools sometimes depended on personal connections. Now students take an entrance exam created by the National Secretariat of Higher Education, Science, Technology, and Innovation (SENESCYT) that measures basic learning skills and suggests a career path. Some say the results are more than just suggestions. Fernando Mino-Garces, of the Andean Center for Latin American Studies, told Pulitzer Center students are not free to choose. However, that has been denied by SENESCYT Secretary René Ramírez, who said misinformation had been spread by opposition presidential candidates. 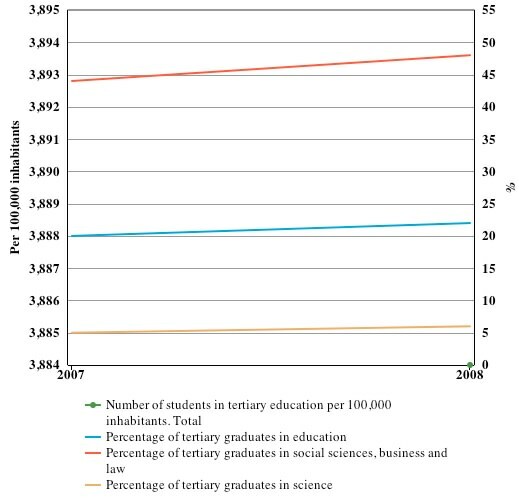 UNESCO data, below, shows that social sciences/business/law programmes are the most common fields in which Ecuadorians graduate, with just under 50% of all students opting for those paths. That group is followed by education in a distant second place at about 23%. UNESCO’s most recent information on this subject dates from 2008. In recent years, more and more students have been leaving Ecuador for studies abroad. 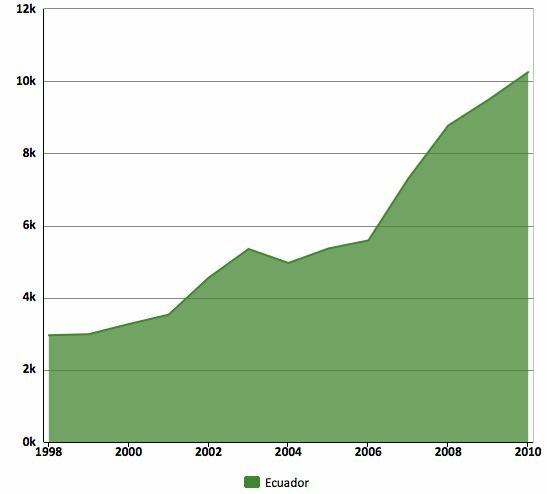 UNESCO tracks international outbound mobility through its Institute for Statistics, and its most recent data on Ecuador, from 2010, shows slightly more than 10,000 Ecuadorians attending university outside the country – a marked increase since 2006. Universidades de Excelencia (Universities of Excellence) – awarded to students wishing to seek a degree overseas in various life sciences, natural sciences, and social science fields. Enseña Inglés (Teach English) programme – offers funding for English training overseas on the condition of returning to Ecuador to teach in the public school system. For educators and agents, a good starting point for making contact in Ecuador is the confederation COICEC, an association of ten established agencies. Several of the members have been involved in the educational market for many years. In addition, readers might like to review our recent article on the ALFA PUENTES project, which discusses the increasing collaboration of more than 20 national and international university associations from across Latin America and Europe. Those looking to partner in Ecuador will find an education landscape markedly different today than it was only five years ago. Change was assured by the 2008 constitution, and gained momentum in 2009 when a nationwide evaluation revealed that one in three universities was of poor quality. In 2010 President Rafael Correa pushed through the new higher education law, and in April 2012 the government shut down 14 universities that did not meet basic academic standards, required professors at the remaining schools to possess advanced degrees by 2017, and enacted admissions tests for prospective college students. The establishment of four new public universities, with an accompanying plan to use one of those schools to anchor an internationally recognised city of knowledge in the Ecuadorian highlands. The new city of knowledge is the key element of a carefully planned pivot away from a mining and banana exportation economy to a modern economy. The school there is called Yachay, and its focus is in five high growth areas – life sciences, IT, nanotechnology, energy, and petrochemicals – with the hope is that it can one day innovate alongside other global knowledge centres such as Silicon Valley. Ecuador is also revamping its technical education sector with three new degrees. The government hopes to see 23% of Ecuadorian students electing to pursue technical education in disciplines such as fishing, transport, and tourism by 2016. In order to reach this percentage, the government will spend US$308 million building or improving 40 technical institutes across the country. It has been a rocky road for Ecuador, whose 2008 constitution was its twentieth. The Correa government hopes education can be the key to long term stability, and the administration’s approval ratings at least suggest that the majority of the population is willing to show patience as current plans move forward. For educators and agents, this new stability represents the opportunity to form lasting partnerships in the country. This entry was posted in Ecuador, Higher Education, K-12, Regions, South & Central America, Vocational and tagged secondary schools for international students, primary schools abroad, international students, education abroad, tertiary education overseas.